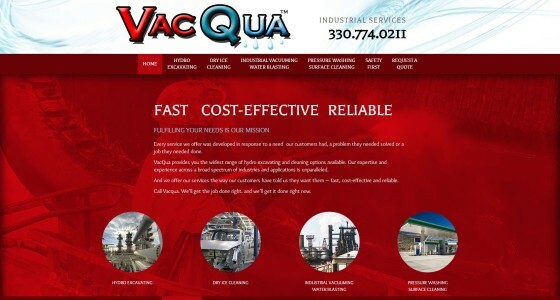 VacQua offers a wide range of hydro excavating and cleaning options to a variety of industry sectors, including aerospace, automotive, food processing, foundries, manufacturing, medical, plastics, printing, oil and gas, utilities and many others. Farris created a graphically engaging website that highlights each of these services, as well as sales-oriented print materials. VacQua’s new website is presents information in a compact form without compromising graphic design. This single page website implements Bootstrap responsive website technologies while using other web design elements to animate page scrolling and other features.